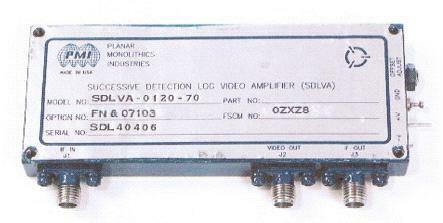 The Model SDLVA-0120-70-FN-07103 (SDLVA) Operates over the 700 to 1300 MHz Range. These units have a Dynamic Range of 65 to 70 dB a TSS of -67 dBm and a Nominal Video Bandwidth of 20 MHz. Furthermore, these units are designed using cutting edge GaAs Technology which provides stunning performance and reliability in a compact package making it an optimum solution for high speed channelized receiver applications. These units offer typical fast Rise time ≤20nS, Rapid Fall Time ≤25 nS as well as superior delay time of 8 nsec. 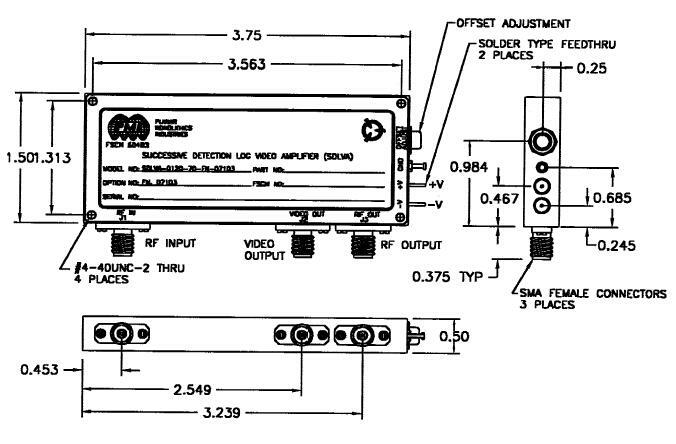 The Log Slope is 25 mV/dB and the Accuracy is less than ±1.0 dB over the -60 to 0 dBm power input range. Dynamic Range can be extended to -65/+5 with log error of ±1.5 dB. Options are available with adjustable logging slope and DC Offsets. The SDLVA-0120-70-FN-07103 SDLVA is commercially screened and characterized from -55ºC to +85ºC. Sizes available are 3.75" x 1.50" x 0.50" or to any other customized configuration desired.